The idea for Lost Reaper came to me after a conversation with a fellow book lover about what trends would follow on the heels of the vampire/werewolf/angel stories that were making readers swoon the world over. While I’ve always had a soft spot for zombies and do enjoy reading about aliens, I was looking for something different. After binge watching the first five seasons of Supernatural I started thinking about reapers and what would happen if a supposedly ordinary young woman was forced to become one. Fast forward a few years and that story is finally making its way out into the world, and I hope readers find my reapers equally as fascinating as the other creatures that go bump in the night. You can find out more about this book on Shelley’s Facebook page and buy it at Amazon. 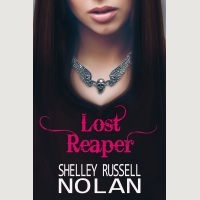 Ormiston Press and Shelley would like to give a copy of Lost Reaper to one lucky ARRA member. All you need to do to enter is comment on this blog article. The giveaway will close on 6 November. Congratulations Shelley on your release. The Reaper would be a new theme for me to read about, so very keen to read your book . Thanks, Yvonne. Glad to hear you are keen to read about reapers. I certainly loved writing about them. Hi Yvonne. Congratulations, you have won an ebook copy of Lost Reaper. Please contact me on my facebook author page – https://www.facebook.com/ShelleyRussellNolan and let me know what format you would like. Thanks Cheryse. Hope you enjoy it. Would love to hear what you think.